A time series is a collection of observations of well-defined data items obtained through repeated measurements over time. For example, measuring the value of retail sales each month of the year would comprise a time series. Identify patterns in the data – stationarity/non-stationarity. My data set contains data of Sales of CARS from Jan-2008 to Dec 2013. As a first step, Understand the data visually, for this purpose, the data is converted to time series object using ts(), and plotted visually using plot() functions available in R.
Forecast package is written by Rob J Hyndman and is available from CRAN here. 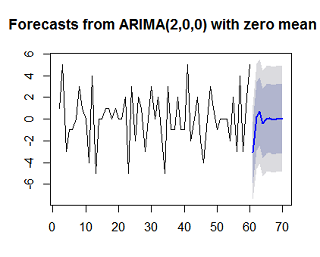 The package contains Methods and tools for displaying and analyzing univariate time series forecasts including exponential smoothing via state space models and automatic ARIMA modelling. 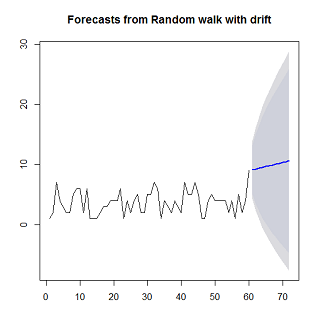 Before going into more accurate Forecasting functions for Time series, let us do some basic forecasts using Meanf(), naïve(), random walk with drift – rwf() methods. Though these may not give us proper results but we can use the results as bench marks. 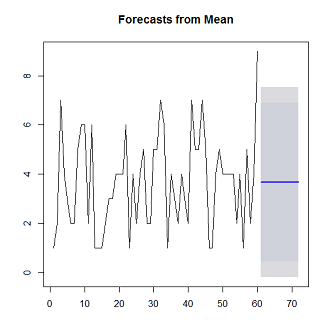 All these forecasting models returns objects which contain original series, point forecasts, forecasting methods used residuals. Below functions shows three methods & their plots. 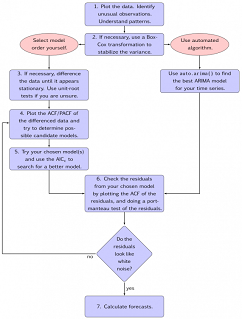 Once the model has been generated the accuracy of the model can tested using accuracy(). The Accuracy function returns MASE value which can be used to measure the accuracy of the model. The best model is chosen from the below results which gives have relatively lesser values of ME,RMSE,MAE,MPE,MAPE,MASE. Check for identifying under lying patterns - Stationary & non-stationary, seasonality, trend. After the patterns have been identified, if needed apply Transformations to the data – based on Seasonality/trends appeared in the data. Apply forecast() the future values using Proper ARIMA model obtained by auto.arima() methods. 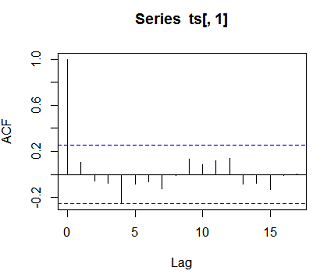 A stationary time series is one whose properties do not depend on the time at which the series is observed. Time series with trends, or with seasonality, are not stationary. The stationarity /non-stationarity of the data can be known by applying Unit Root Tests - augmented Dickey–Fuller test (ADF), Kwiatkowski-Phillips-Schmidt-Shin (KPSS) test. ADF: The null-hypothesis for an ADF test is that the data are non-stationary. 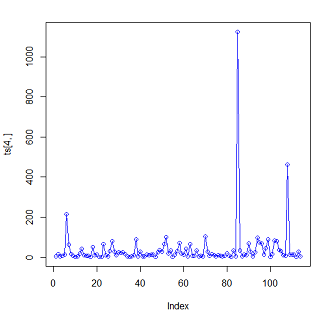 So large p-values are indicative of non-stationarity, and small p-values suggest stationarity. Using the usual 5% threshold, differencing is required if the p-value is greater than 0.05. The above figure suggests us that the data is of stationary and we can go ahead with ARIMA models. KPSS: Another popular unit root test is the Kwiatkowski-Phillips-Schmidt-Shin (KPSS) test. This reverses the hypotheses, so the null-hypothesis is that the data are stationary. In this case, small p-values (e.g., less than 0.05) suggest that differencing is required. Based on the unit test results we identify whether the data is stationary or not. If the data is stationary then we choose optimal ARIMA models and forecasts the future intervals. If the data is non- stationary, then we use Differencing - computing the differences between consecutive observations. Use ndiffs(),diff() functions to find the number of times differencing needed for the data & to difference the data respectively. Now retest for stationarity by applying acf()/kpss() functions if the plots shows us the Stationarity then Go ahead by applying ARIMA Models. Since my data doesn’t contain any seasonal behavior I will not touch the Seasonality part. 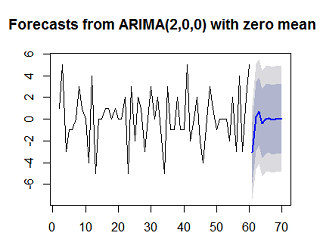 For forecasting stationary time series data we need to choose an optimal ARIMA model (p,d,q). For this we can use auto.arima() function which can choose optimal (p,d,q) value and return us. Know more about ARIMA from here. 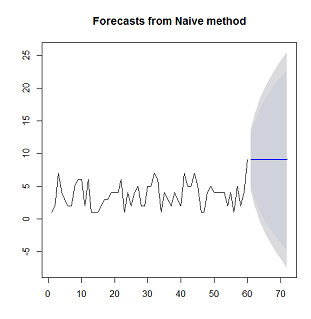 Now we use forecast() method to forecast the future events.